A black and white photograph of the Dayton Tire factory. 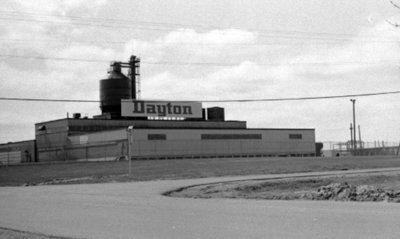 The Dayton Tire factory was built in 1954-55 for the Dunlop Tire and Rubber Company. In 1974 it was sold to Firestone Tire and the name changed to Dayton Tire and later Whitby Tire. The company closed in 1980 and was divided into small industrial units. This building is located at 202 South Blair Street. This item is protected by the Canadian Copyright Act and is intended for one-time use only. Uses other than research or private study require the permission of the rightsholder(s). It is your responsibility for obtaining these permissions. Dayton Tire, April 1976, Brian Winter. Whitby Archives A2013_004_027A. Scanned from black and white negative.